Band, Choir, Color Guard, and Tech Crew. Mr. Salgado is also the Assistant Speech sponsor. Ben Salgado is a fine arts teacher at Bremen H.S. He is the Director of Bands & Choirs, an Audio Engineering teacher, the Assistant Speech Coach, Color Guard Director, and the Tech Crew Director. Prior to coming to Bremen H.S. he taught music, art, drama and band at Heritage M.S. in Summit, IL and music at George Washington H.S. in Chicago, IL. He is in his 16th year of teaching, and his 14th year at Bremen H.S. Mr. Salgado graduated from Argo Community H.S. in Summit, IL. He was very active in school activities and sports, including band, choir, drama, baseball, golf, cheerleading, and student government (serving as senior class president). In 1996 Mr. Salgado was selected by audition to the All-Midwest Grammy Jazz Ensemble (lead trumpet) and the All-American Grammy Jazz Ensemble where he performed with guest artists Arturo Sandoval and Carlos Santana. He was also named a Golden Apple Scholar in 1996. Mr. Salgado earned his Bachelor of Music in Music Education degree from Elmhurst College. During his time at Elmhurst he performed in many musical ensembles including the Concert Band, the Concert Choir, several jazz combos and the internationally acclaimed Elmhurst College Jazz Band, under the direction of Doug Beach. In addition to performing throughout the United States, Mr. Salgado performed with the Elmhurst College Jazz Band in Indonesia (Jak Jazz Festival), Italy (Umbria Jazz Festival), Switzerland (Montreux Jazz Festival), Ireland, England, Sicily and Malta. While he was at Elmhurst College he performed with numerous guest artists, including Clark Terry, Nicholas Payton, Diane Schuur, Dee Dee Bridgewater, Mark Colby, Brian Culbertson, and Frank Mantooth. 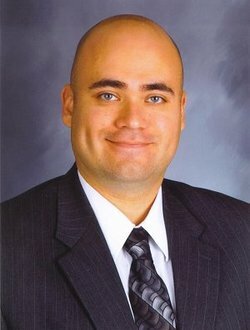 Mr. Salgado earned a Master of Education degree in Curriculum and Instruction from Olivet Nazarene University in 2012 and has completed coursework at Vandercook College of Music. Mr. Salgado is married and has two children. He serves on the board of the Lincoln-Way Theatre Guild (LWTG), is President of the Indian Trail School & Community Organization (ITSCO), is a Religious Education Teacher, and a Cub Scout leader. 2015 - Give Up The Funk! Big River - Cast - "The Duke"